Installer: Bontrager Concrete Specialties Inc..
Products Used: Ready Mix Concrete, Color Hardener, Powder Release, Eco-Stain, Xtreme Series Lightweight Plus. First impressions are the begining to all relationships. Many communities have reputations based not just on income levels, but also on how the front of the homes appear from the road. 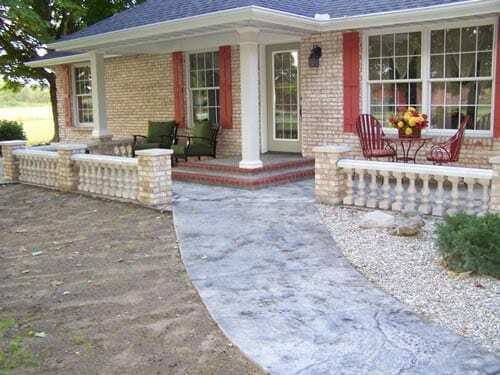 In a neighborhood in Nappanee, Indiana one homeowner took it upon themselves to increase their homes internal beauty by customizing their entire front porch and walkways. Their vision was to have a natural looking rock walkway, customized concrete balusters and wall caps, while tying it into their brick facade. 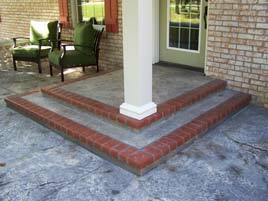 To accomplish their concrete front porch home makeover, they called upon a local team of experts, Bontrager Concrete Specialties Inc. . After discussing all design options, they decided on stamped concrete to create their natural looking stone sidewalks and porch area. This process included tearing out the old concrete, pouring new concrete, and then using custom stamping tools that create the old granite look seen in the photos. The color scheme was made through high quality color hardeners and powder release agents designed to help handle the intense winters that happen in Indiana. An added feature was the “Antique Brick” patterns that were added into the process of stamping the freshly poured concrete. The makeover of this front porch was completed by the creation of custom lightweight concrete balusters and wall caps. 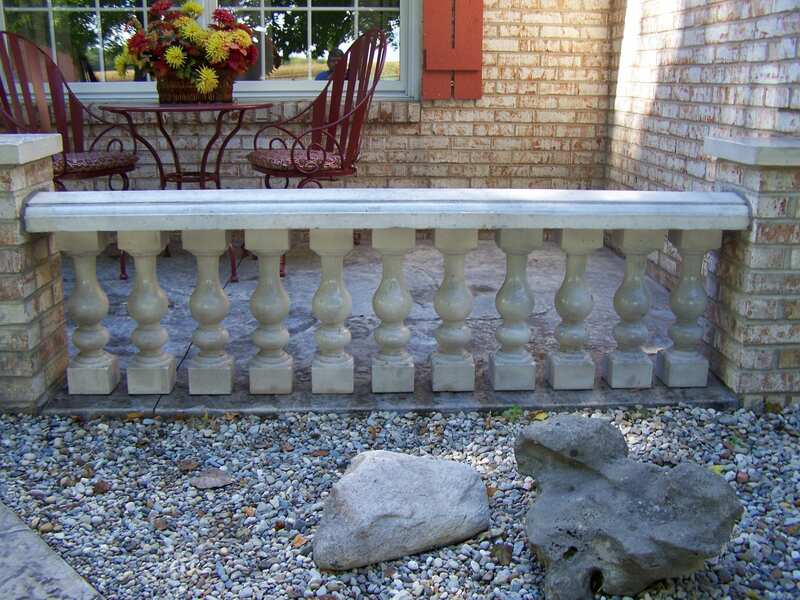 Many places offer white or gray balusters, but the team at Bontrager Concrete Specialties have the ability to create a natural aged look and tie in the colors of the new stamped concrete walkways. 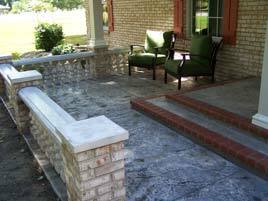 Their process included the use of an environmentally safe concrete stain called Eco-Stain. This product designed by SureCrete offers 29 UV-stable colors that can enhance the look of any concrete surface. 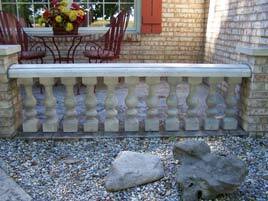 This process was key to getting the balusters and wall caps to become apart of the front porch design. In the end, this home has elevated its exterior beauty to not just the satisfaction of its owners. But to the community in Nappanee. Through the use of customized concrete, their dreams are now a daily reality in which they get to look forward to come home to every day.